The year 1945 is immediately recognizable as the year World War II ended. While this might be an exhilarating year for most Europeans fighting the Germany and her allies, it certainly isn’t for a small Hungarian village. Most of the villagers from the film’s unnamed village in Hungary fear that Jews will return after the War to reclaim their property that have been taken away from them and redistributed to these Hungarians. And some unjustly. The town clerk, Mr. István (Péter Rudolf ) had informed of his Pollaks neighbours while getting a fellow villager to testify as a witness. Worst, he guiltlessly watched from his window as his best friend and family were taken away by the Nazis. He also bribed to get his son out of the army. Few films on World War II have depicted the effects on those left behind by those who went off to fight during the War. The excellent recent French film, Xavier Beauvois’ LES GARDIENNES (which is a real crime that it was surprisingly not commercially released in Toronto) demonstrated in great detail how farmworkers survived without any males. 1945 is a Hungarian drama that demonstrates the evil that human beings exhibit as a result of that War, even when staying behind in the village and not going to fight. Török, who also co-wrote the film directs it in a straight forward manner without resorting to cheap theatrical effects, realizing and relying on the strength of the film’s source material. The film’s period atmosphere is greatly enhanced by the film’s stark and clear black and white cinematography. The catalyst of the story is the arrival of two Jewish survivors of the Holocaust (there is a camera closeup of the concentration camp tattooed numbers on one of their arms) by train to the village – a father and son. The purpose of their visit is unclear to the villagers and they assume they are back to reclaim land that had been taken away from them. The individual villagers have different reactions, mostly unpleasant. The story contains a sufficient assortment of characters in varying situations to keep audience’s interest piqued. Besides the town clerk, his son is a coward about to be married to a woman who clearly does not love him, but the drugstore that his family owns. She, Kisrózsi (Dóra Sztarenki) has an affair with Jancsi (Tamás Szabó Kimmel) who is unafraid to flaunt the affair as well as side with the liberating Russians in the village. He is also flirting with a younger woman in front of her. The town drunk is guilty of being the town clerk’s witness and his wife is hiding all the expensive rugs and silverware the family took from the Jews. The priest is no Godly saint either, having stolen from the Jews. This paragraph in bold italics contains minor spoilers: Interesting during the first half, director Török brings his film to an impressive climax where the clerk’s son leaves the village in despair and the deserted bride takes revenge on the groom’s family. Despite all the gloom and despair on display, there is a bit of hope in the clerk getting his comeuppance and his son finally breaking away from his family’s hold. When it is revealed the true purpose of the Jew’s visit, there is also some sympathy shown by the villagers. The film was screened in the Panorama section at the 67th Berlin International Film Festival and was awarded the 3rd place prize in the Panorama Audience Award. 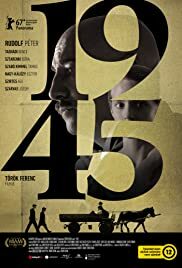 1945, a sincerely made film about the emotional baggage left behind by WWII is one of the best foreign films released so far this year and indeed worthy of a Best Foreign Language Film Oscar nomination.